If your engine makes a deep knocking sound, which is worse on acceleration, it could mean that parts deep inside the engine have worn out. If worn rod bearings are the culprit, they will give-out if you continue to drive. It is best if you park your car until you identify and repair the cause. Valvetrain components such as rocker arms, timing chains and camshaft followers make a ticking or clicking noise during motion, and this noise can be amplified if something is off. The most common cause of engine ticking we see at Master Mechanic is worn components of a low oil level. Sometimes, noises like this can be fixed by having your oil changed. If not more major engine investigation and repair will be necessary. or replacing one part. New noises should be investigated promptly to minimize damage to your engine. If you hear a noise at idle that increases is an indication that something is worn out and requires attention. These noises can start off as small issues but can quickly turn into more severe issues. It’s best to contact your local Master Mechanic as soon as possible. Engines are complex machines. If you happen to hear the occasional noise that’s short-lived and stops as quickly as it starts, then you probably don’t need to worry. This is usually something as harmless as your oil settling at the bottom of the engine when you start it. In fact, you may have noticed it more on winter mornings, when your oil is a bit thicker from the lower temperature. If you have any doubts, it’s always better to be safe than sorry. Your engine is one of the most expensive parts in your car, and you want to be as proactive as possible to prevent any major damage. 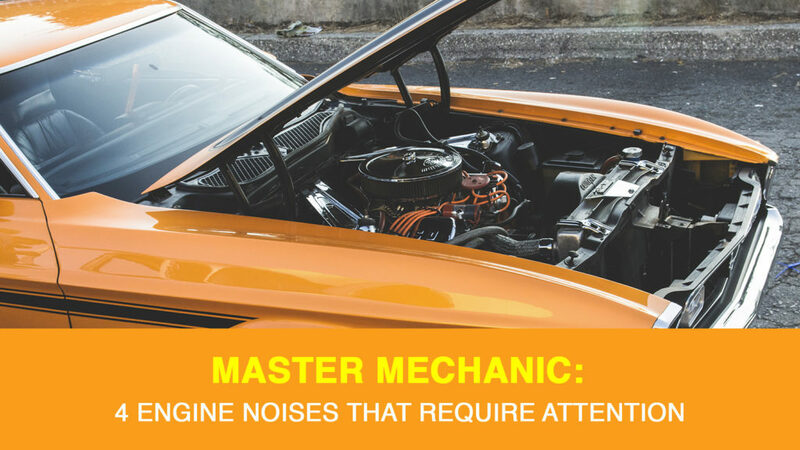 To schedule a repair, inquire about a noise, or get a quote don’t hesitate to contact your local Master Mechanic today! < Ask A Master Mechanic: Where’s My Flying Car?